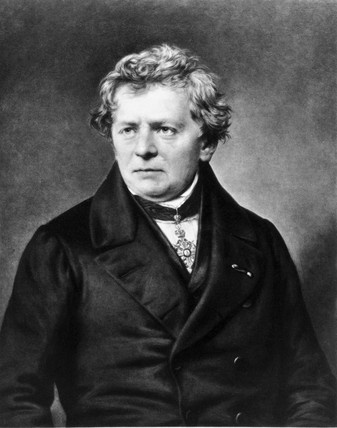 Today is the birthday (1789) of Georg Simon Ohm a Bavarian physicist and mathematician who gave his name to the equation relating voltage, resistance, and current: Ohm’s law. Ohm was born in Erlangen, Brandenburg-Bayreuth (then a part of the Holy Roman Empire), son to Johann Wolfgang Ohm, a locksmith and Maria Elizabeth Beck, the daughter of a tailor in Erlangen. Although his parents had not been formally educated, Ohm’s father was a respected man who had educated himself, and, in consequence, was able to give his sons an excellent education through his own instruction. Of the seven children of the family only three survived to adulthood: Georg Simon, his younger brother Martin, who later became a well-known mathematician, and his sister Elizabeth Barbara. His mother died when he was ten. From early childhood, Georg and Martin were taught by their father who brought them to a high standard in mathematics, physics, chemistry and philosophy. Georg attended Erlangen Gymnasium from age 11 to 15 where he received little in the area of scientific training, which sharply contrasted with the inspired instruction that both he and his brother received from their father. Ohm’s father, concerned that his son was wasting his educational opportunity, sent him to Switzerland, where in September 1806 he accepted a position as a mathematics teacher in a school in Gottstadt bei Nidau. Ohm left his teaching post in Gottstatt Monastery in March 1809 to become a private tutor in Neuchâtel. For two years he carried out his duties as a tutor while and continued his private study of mathematics. Then in April 1811 he returned to the University of Erlangen. Ohm’s own studies prepared him for his doctorate which he received from the University of Erlangen on 25th October 1811. He immediately joined the faculty there as a lecturer in mathematics but left after three terms because of unpromising prospects. He could not survive on his salary as a lecturer. The Bavarian government offered him a post as a teacher of mathematics and physics at a poor-quality school in Bamberg which Ohm accepted in January 1813. Unhappy with his job, Georg began writing an elementary textbook on geometry as a way to prove his abilities. That school was closed in February 1816. The Bavarian government then sent Ohm to an overcrowded school in Bamberg to help out with the teaching of mathematics. After his assignment in Bamberg, Ohm sent his completed manuscript to King Wilhelm III of Prussia. The King was impressed with Ohm’s book, and offered him a position at the Jesuit Gymnasium of Cologne on 11th September 1817. This school had a reputation for good science education and Ohm was required to teach physics in addition to mathematics. The physics laboratory was well equipped, allowing Ohm to begin experiments in physics. As the son of a locksmith, Ohm also had some practical experience with mechanical devices. Ohm published Die galvanische Kette, mathematisch bearbeitet (The Galvanic Circuit Investigated Mathematically) in 1827. 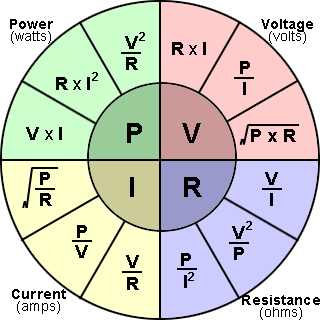 Ohm’s law [current (I) = voltage (V) divided by resistance (R)] first appeared in this book, as did his comprehensive theory of electricity. The book begins with the mathematical background necessary for an understanding of the rest of the work. While his work greatly influenced the theory and applications of current electricity, it was coldly received at that time. It is interesting that Ohm presents his theory as one of contiguous action, a theory which opposed the concept of action at a distance. Ohm believed that the communication of electricity occurred between “contiguous particles” which is the term he himself used. The paper is concerned with this idea, and in particular with illustrating the differences in this scientific approach of Ohm’s and the approaches of Joseph Fourier and Claude-Louis Navier. Ohm’s college did not appreciate his work and so he resigned from his position. He then made an application to, and was employed by, the Polytechnic School of Nuremberg. 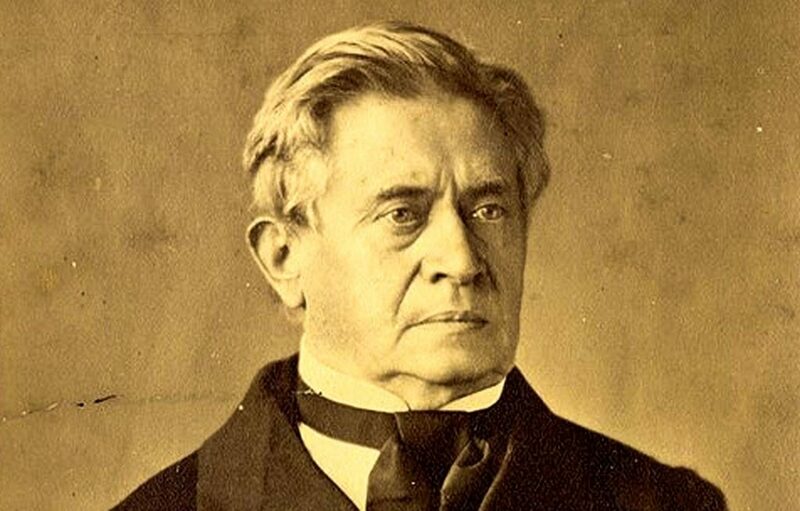 Ohm arrived at the Polytechnic School of Nuremberg in 1833, and in 1852 he became a professor of experimental physics at the University of Munich. Ohm died in Munich in 1854 and is buried in the Alter Südfriedhof. Ohm’s name has been incorporated in the terminology of electrical science in Ohm’s Law, and adopted as the SI unit of resistance, the ohm (symbol Ω). Although Ohm’s work strongly influenced theory, at first it was received with little enthusiasm. However, his work was eventually recognized by the Royal Society with its award of the Copley Medal in 1841. He became a foreign member of the Royal Society in 1842. 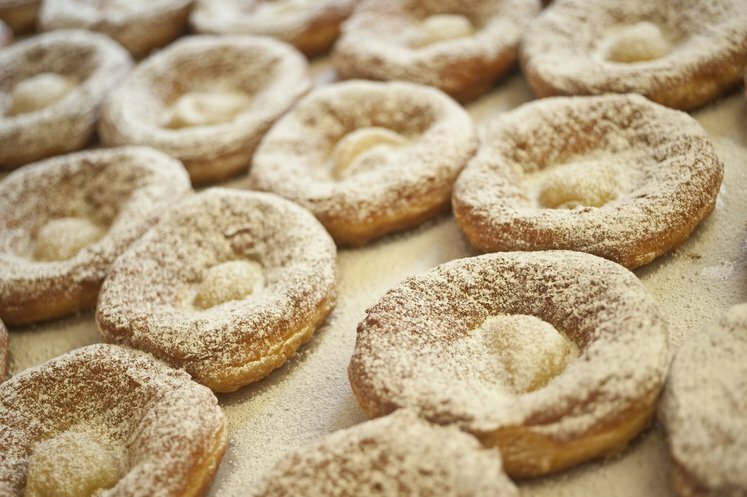 Knieküchle is a traditional Franconian fried dough pastry that is very popular in Old Bavaria as well. Depending on region it has several other names, including Auszogne, Krapfen, Küchl, or Rottnudel. As a general rule they are made of yeast dough but some recipes vary slightly. Very common for example is the addition of raisins. The dough is shaped so it is very thin in the middle and thicker on the edges. They are then fried in lard and dusted with confectioner’s sugar. The pastry is mostly eaten for celebrations, so it is appropriate today to celebrate Ohm. In Franconia, people differentiate between “Catholic” and “Protestant” Knieküchle depending whether it is dusted with confectioner’s sugar or not. Ohm was Protestant, so you decide. In a small bowl, combine the yeast and ½ cup of the milk (lukewarm). Mix in 3 tablespoons flour and 1 teaspoon of the sugar. Allow this mixture to sit in a warm place for 1 hour. Combine the remaining dough ingredients then add in the yeast mixture. Mix until a smooth dough forms, adjusting the flour as necessary. Knead by hand for about 20 minutes. Place the dough in a lightly greased bowl, cover, and let sit in a warm place until double in volume. Punch the dough down and divide it into tablespoon size pieces. Press each piece of dough flat and allow them to rise again for 1 hour. Heat the oil in a deep-fryer to around 370˚F/190˚C. Take each piece of dough and stretch it out again – large enough that it would be able to cover your knee [why they are called “knee pastries]. Fry each stretched-out piece of dough until golden brown on both sides. Remove from the oil with a slotted spoon and let drain on wire racks. Dust with powdered sugar if you wish. They can be eaten plain or with fruit preserves. They are best served warm. 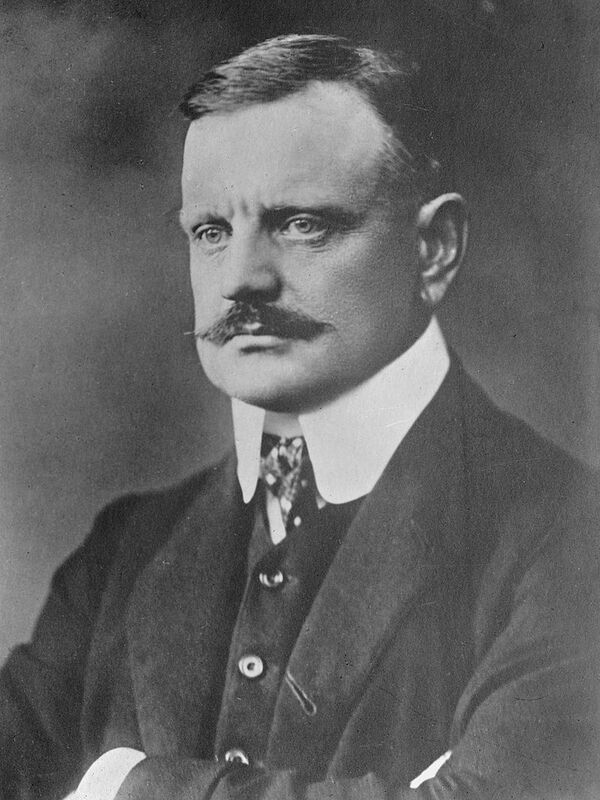 Today is the birthday (1865) of Jean Sibelius, born Johan Julius Christian Sibelius, Finnish composer and violinist of the late Romantic and early-modern periods who is widely recognized as his country’s greatest composer and, through his music, is often credited with having helped Finland to develop a national identity during its struggle for independence from Russia. The core of his oeuvre is his set of 7 symphonies which, like his other major works, continue to be performed and recorded in his home country and internationally. His other best-known compositions are Finlandia, the Karelia Suite, Valse triste, the Violin Concerto, the choral symphony Kullervo, and The Swan of Tuonela (from the Lemminkäinen Suite). Yet other works include pieces inspired by nature, Nordic legend, and the Finnish national epic, the Kalevala. He wrote over 100 songs for voice and piano, incidental music for numerous plays, the opera Jungfrun i tornet (The Maiden in the Tower), chamber music, piano music, Masonic ritual music, and 21 pieces of choral music. Sibelius composed prolifically until the mid-1920s, but after completing his 7th symphony (1924), the incidental music for The Tempest (1926) and the tone poem Tapiola (1926), he failed to produce any major works in his last 30 years, a perplexing decline commonly referred to as “The Silence of Järvenpää”, the location of his home. Although he is reputed to have stopped composing, he attempted to continue writing, including abortive efforts on an eighth symphony. In later life, he wrote Masonic music and re-edited some earlier works while retaining an active, but not always favorable, interest in new developments in music. Sibelius was born in Hämeenlinna in the Grand Duchy of Finland, an autonomous part of the Russian Empire. He was the son of the Swedish-speaking docto,r Christian Gustaf Sibelius, and Maria Charlotta Sibelius née Borg. Sibelius’ father died of typhoid in July 1868, leaving substantial debts. As a result, his mother—who was again pregnant—had to sell their property and move the family into the home of Katarina Borg, her widowed mother, who also lived in Hämeenlinna. His uncle, Pehr Ferdinand Sibelius, who was interested in music, especially the violin, gave Sibelius a violin when he was 10 years old and later encouraged him in his interest in composition. From an early age, Sibelius showed a strong interest in nature, frequently walking around the countryside when the family moved to Loviisa on the coast for the summer months. In his own words: “For me, Loviisa represented sun and happiness. Hämeenlinna was where I went to school; Loviisa was freedom.” When he was 7, in Hämeenlinna, his aunt Julia was brought in to give him piano lessons on the family’s upright instrument, rapping him on the knuckles whenever he played a wrong note. He progressed by improvising on his own, but still learned to read music. He much preferred it when he turned to the violin. 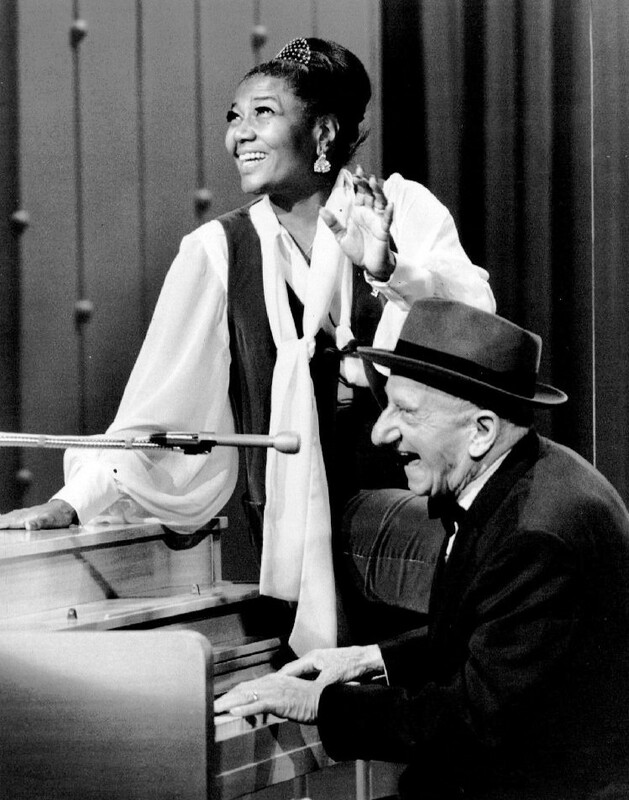 He participated in trios with his elder sister Linda on piano, and his younger brother Christian on the cello. (Christian Sibelius was to become an eminent psychiatrist, still remembered for his contributions to modern psychiatry in Finland). 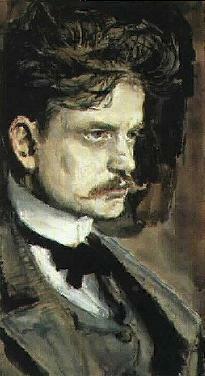 In addition, Sibelius often played in quartets with neighboring families, adding to his experience in chamber music. Fragments survive of his early compositions of the period, a trio, a piano quartet and a Suite in D Minor for violin and piano. Around 1881, he recorded on paper his short pizzicato piece Vattendroppar (Water Drops) for violin and cello although it might just have been a musical exercise. The first reference he himself made to composing comes in a letter from August 1883 in which he reveals he had composed a trio and was working on another: “They are rather poor, but it is nice to have something to do on rainy days.” In 1881, he started to take violin lessons from the local bandmaster, Gustaf Levander, immediately developing a particularly strong interest in the instrument. Setting his heart on a career as a great violin virtuoso, he soon succeeded in becoming quite an accomplished player, performing David’s Concerto in E minor in 1886 and, the following year, the last two movements of Mendelssohn’s Violin Concerto in Helsinki. Despite such success as an instrumentalist, he ultimately chose to become a composer. After graduating from high school in 1885, Sibelius began to study law at the Imperial Alexander University in Finland but, showing far more interest in music, soon moved to the Helsinki Music Institute (now the Sibelius Academy) where he studied from 1885 to 1889. One of his teachers was its founder, Martin Wegelius, who did much to support the development of education in Finland. It was he who gave the self-taught Sibelius his first formal lessons in composition. Another important influence was his teacher Ferruccio Busoni, a pianist-composer with whom he enjoyed a lifelong friendship. His close circle of friends included the pianist and writer Adolf Paul and the conductor-to-be Armas Järnefelt, (who introduced him to his influential family including his sister Aino who would become Sibelius’s wife). The most remarkable of his works during this period was the Violin Sonata in F, rather reminiscent of Grieg. Sibelius continued his studies in Berlin (from 1889 to 1890) with Albert Becker, and in Vienna (from 1890 to 1891) with Robert Fuchs and Karl Goldmark. 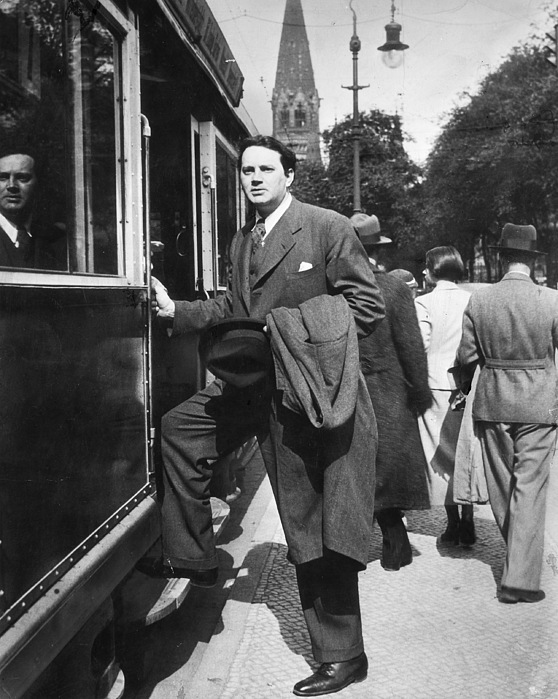 In Berlin, he had the opportunity to widen his musical experience by going to a variety of concerts and operas, including the premiere of Richard Strauss’s Don Juan. He also heard the Finnish composer Robert Kajanus conducting the Berlin Philharmonic in a program which included his symphonic poem Aino, a patriotic piece which may well have triggered Sibelius’s later interest in using the epic poem Kalevala as a basis for his own compositions. While in Vienna, he became particularly interested in the music of Anton Bruckner whom, for a time, he regarded as “the greatest living composer”, although he continued to show interest in the established works of Beethoven and Wagner. It was also in Vienna that he turned to orchestral composition, working on an Overture in E major and a Scène de Ballet. While embarking on Kullervo, an orchestral work inspired by the Kalevala, he fell ill but was restored to good health after surgery. Shortly after returning to Helsinki, he conducted his Overture and the Scène de Ballet at a popular concert. He was also able to continue working on Kullervo, now that he was increasingly developing an interest in all things Finnish. It premiered in Helsinki on 28 April 1892 and was an enormous success. My tragedy was that I wanted to be a celebrated violinist at any price. Since the age of 15 I played my violin practically from morning to night. I hated pen and ink — unfortunately I preferred an elegant violin bow. My love for the violin lasted quite long and it was a very painful awakening when I had to admit that I had begun my training for the exacting career of a virtuoso too late. In addition to the long periods he spent studying in Vienna and Berlin (1889–91), in 1900 he traveled to Italy where he spent a year with his family. He composed, conducted and socialized actively in the Scandinavian countries, the UK, France and Germany and later traveled to the United States. Rather than take on Sibelius’ entire oeuvre, I’ll touch on Finlandia here, commenting also on the ways it has been reworked for other uses. Finlandia, Op. 26, is a tone poem first written in 1899 and revised in 1900. The piece was originally composed for the Press Celebrations of 1899, a covert protest against increasing censorship from the Russian Empire, and was the last of seven pieces performed as an accompaniment to tableaux depicting episodes from Finnish history. The premiere of the revised piece, now what is usually heard, was on 2 July 1900 in Helsinki with the Helsinki Philharmonic Society conducted by Robert Kajanus. In order to avoid Russian censorship, Finlandia had to be performed under alternative names at various musical concerts. Titles under which the piece masqueraded were numerous—famous examples include Happy Feelings at the awakening of Finnish Spring, and A Scandinavian Choral March. The original movements for tableaux are as follows. In February 1899 Nicholas II, tsar of Russia, issued a “February Manifesto” which aimed to restrict the autonomy of the Grand Duchy of Finland. 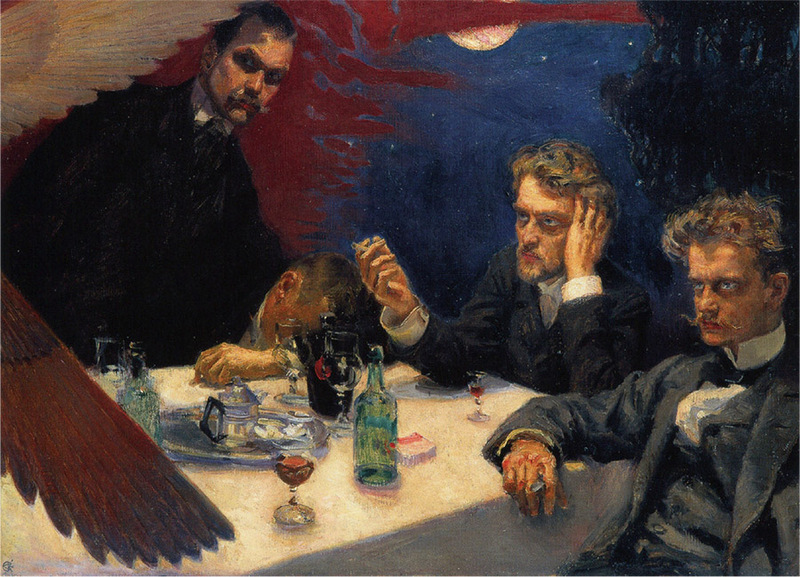 This stirred opposition in most Finnish cultural circles, and paintings with protest themes became very popular. Sibelius wished to use his music to add to the protests. In 1899 he wrote The Song of the Athenians and The Breaking of the Ice on Oulu River. The year was crowned by his music for tableaux staged as part of the main event of the Days of the Press. The performances took place at the beginning of November 1899 at the Swedish Theatre. 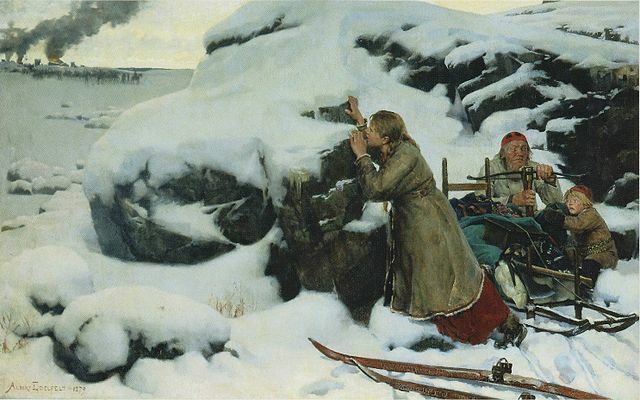 The tableaux depicted scenes from the history of Finland. In the “Great Hate” tableau the performance had a particularly sharp edge. Mother Finland was sitting in a snowdrift with her children who were shivering with cold. They were threatened by War, Frost, Hunger and Death. Sibelius composed the darkest and most ascetic music for this image. “Finland Awakens” was an early version of Finlandia. Finlandia itself was certainly not composed to describe these various stages in any precise way. Sibelius wanted to portray Finland’s awakening and its fighting spirit in more general terms. Later Sibelius told Jalmari Finne that he had no idea that there was anything special about Finlandia. It was not until he took the score to the copyist Ernst Röllig that it occurred to him that there might be something out of the ordinary in the composition. Why will only the last piece of this suite, which is written in a “symphonic style” (probably the best), be played in Paris? If I can trust what others have told me about this tableau music, the music should be played in its entirety or at least 4 movements of it. And I wonder if the title ‘La Patrie’ is a good idea? It turned out to be difficult to find a suitable title for the composition: in previous concerts it had been Finland, The Awakening of Finland or Finale. On the tour, it was called Vaterland and La Patrie (and possibly other titles). However, in November 1900 the piano arrangement of the tableau was given the name Finlandia – a title suggested by Axel Carpelan – and in February 1901 Kajanus finally conducted the orchestral version of the work under the name Finlandia. Soon the work was printed in an improved version. As early as 1909 an excerpt was recorded under Ronald Landon. Most of the piece is taken up with rousing and turbulent music, evoking the national struggle of the Finnish people. Towards the end, a calm comes over the orchestra, and the serenely melodic Finlandia Hymn is heard. Often incorrectly cited as a traditional folk melody, the Hymn section is of Sibelius’s own creation. Sibelius later reworked the Finlandia Hymn into a stand-alone piece. This hymn, with words written in 1941 by Veikko Antero Koskenniemi, is one of the most important national songs of Finland. With different words, it is also sung as a Christian hymn (Be Still, My Soul, Hail, Festal Day, in Italian evangelical churches: Veglia al mattino), and was used as the national anthem of the short-lived African state of Biafra (Land of the Rising Sun). In the spring of 1963, the Rice University student body voted to establish a school song (Rice is Our Home), using the music from the Finlandia Hymn. The song was played at the 1964 Rice Commencement, but otherwise never officially adopted. Joulupöytä (“Yule table”) is the traditional assortment of foods served at Christmas in Finland, similar to the Swedish julbord. It contains a variety of different dishes, most of them typical for the season. The main dish is usually a large Christmas ham, which is eaten with mustard or bread along with the other dishes. Fish is also served (often lutefisk and gravlax), and the ham is served with laatikkos, casseroles made with swede, potato and carrot, occasionally liver. A dish from the joulupöytä would be suitable to celebrate Sibelius, especially at this time of year. 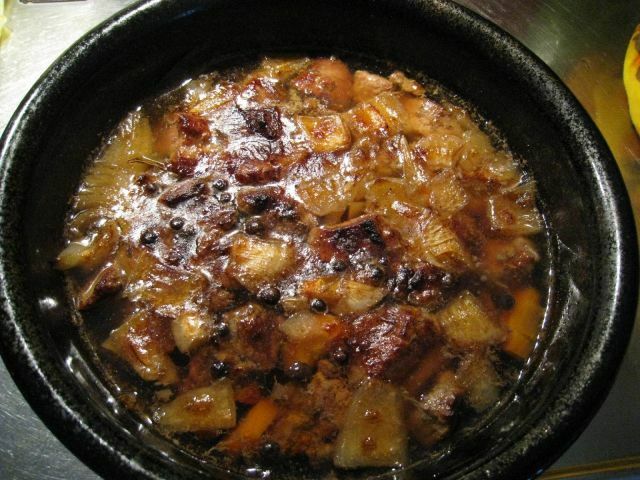 Karjalan Paisti (Karelian Hot Pot) is a very common dish on the yule table and, as is to be expected, varies from household to household. I’m using here a combination of three meats, beef, pork, and lamb, but two is more common. It is conventionally served with mashed potato and lingonberry preserves. Also, it can be cooked in three ways: on the stovetop, in the oven in a casserole, or in a slow cooker. The last method is the most common these days. Brown the meats in small batches on all sides in a skillet over medium-high heat using the olive oil. In whatever vessel you are using to cook the hotpot, layer the ingredients. Begin with half of the sliced onions, add half of the meat, and sprinkle with half of the salt, peppercorns, allspice, and add one bay leaf. Repeat the layers. Cover the meat with water, and tightly cover the vessel. What happens next depends on your choice of cooking method. A slow cooker on low will take about 6 hours. A casserole in a slow oven (250˚F) will take around 4 or 5 hours. A pot on the stove on a slow simmer will take 3 to 4 hours. I prefer a slow cooker. The above quote epitomizes why I don’t care for Wolfe nor the plaudits of “those who know.” Sure, the prose is entertaining, but the sentiment is not anywhere near as universal as Wolfe or others would have it. “All things on earth”? Seriously??? Late October in North Carolina is certainly homecoming time for churches, schools, and families. Homecoming at the local Baptist church in the town in the Tidewater where I lived for a year doing field research was a huge event with a massive Brunswick stew that took 3 days to make and was the talk of the region. But that’s North Carolina, not the whole world. Wolfe’s works are all autobiographical fiction and have a few generalizable themes and rich prose. But, as with Faulkner, you’re going to miss a lot if you don’t know the Old South. I’m not a huge fan of the Old South (which for some reason won’t die), so I don’t relate to Wolfe’s insufferably endless books. He is, of course, revered at UNC Chapel Hill where he was an undergraduate, and a major part of the library is a repository for his papers. I’m pretty sure he would have been both proud and derisive of the reverence. The one thing I do admire unequivocally about Wolfe is his passion for and devotion to writing. He was a thinker, talker, and writer all rolled into one. That’s because the three go together (often – not always). I don’t have the disease to the same extent as Wolfe but I know the feeling. I shape my thoughts (about everything) by talking and writing. Wolfe was born in Asheville, North Carolina, the youngest of eight children of William Oliver Wolfe (1851–1922) and Julia Elizabeth Westall (1860–1945). The Wolfes lived at 92 Woodfin Street, where Tom was born. His father, a successful stone carver, ran a gravestone business. His mother took in boarders and was active in acquiring real estate. In 1904, she opened a boarding house in St. Louis, for the World’s Fair. 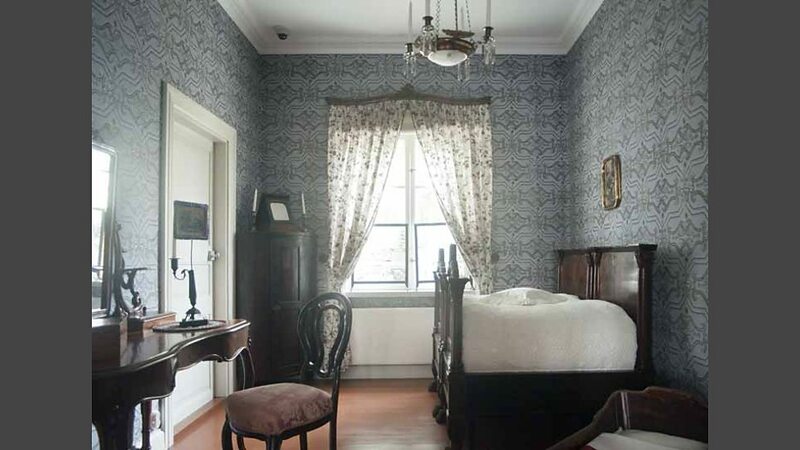 In 1906 Julia Wolfe bought a boarding house named “Old Kentucky Home” at nearby 48 Spruce Street in Asheville, taking up residence there with her youngest son while the rest of the family remained at the Woodfin Street residence. 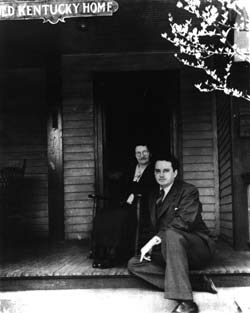 Wolfe lived in the boarding house on Spruce Street until he went to college in 1916. 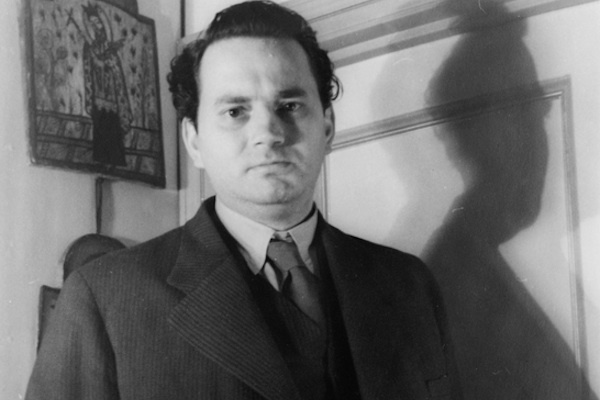 It is now the Thomas Wolfe Memorial. 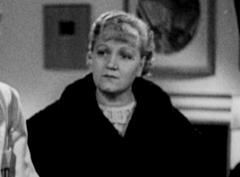 Wolfe was closest to his brother Ben, whose early death at age 26 is chronicled in Look Homeward, Angel. Julia Wolfe bought and sold many properties, eventually becoming a successful real estate speculator. Wolfe began study at the University of North Carolina at Chapel Hill (UNC) when he was 15 years old. He predicted that his portrait would one day hang in New West near that of celebrated North Carolina governor Zebulon Vance, which it does today. In 1919 Wolfe enrolled in a playwriting course. 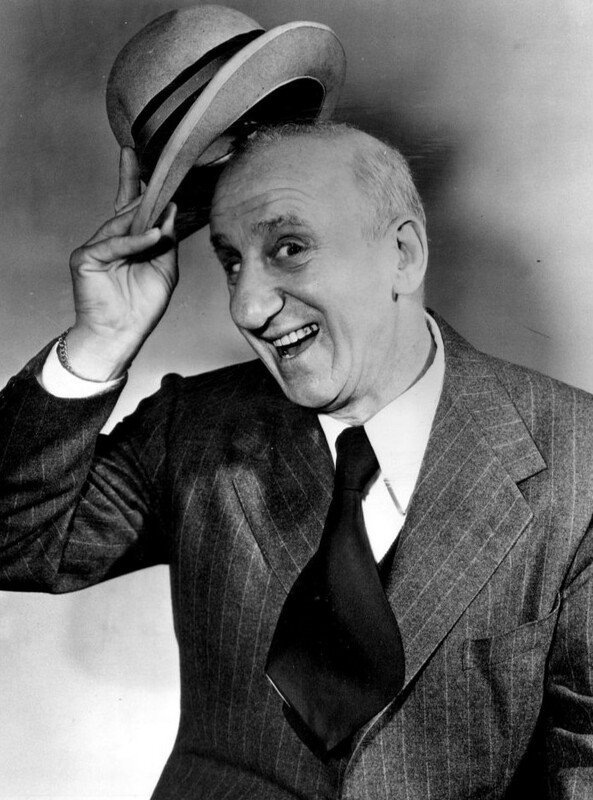 His one-act play, The Return of Buck Gavin, was performed by the newly formed Carolina Playmakers, then composed of classmates in Frederick Koch’s playwriting class, with Wolfe acting the title role. 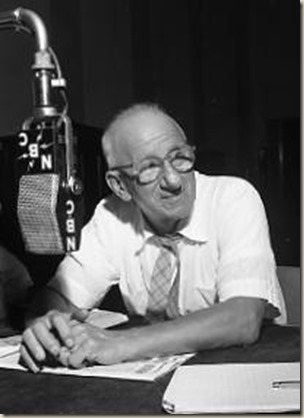 He edited UNC’s student newspaper The Daily Tar Heel (still going strong as a daily), and won the Worth Prize for Philosophy for an essay titled “The Crisis in Industry.” Another of his plays, The Third Night, was performed by the Playmakers in December 1919. Wolfe graduated from UNC with a B.A. in June 1920. In September of that year, he entered the Graduate School for Arts and Sciences at Harvard University, where he studied playwriting under George Pierce Baker. 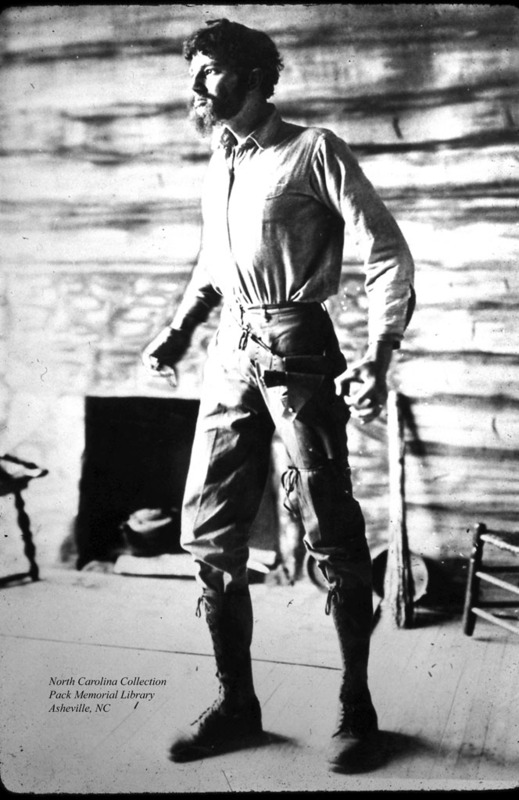 Two versions of his play The Mountains were performed by Baker’s 47 Workshop in 1921. In 1922, Wolfe received his master’s degree from Harvard. His father died in Asheville in June of that year, an event that would strongly influence his writing. 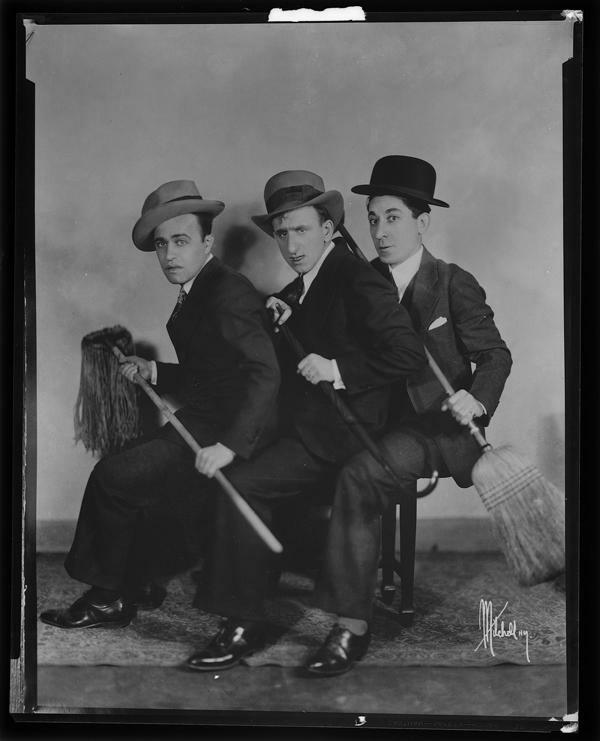 Wolfe continued to study for another year with Baker in the 47 Workshop, which produced his ten-scene play Welcome to Our City in May 1923. 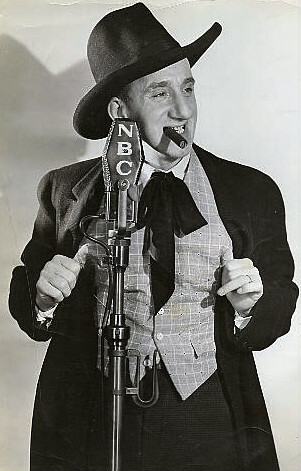 Wolfe visited New York City again in November 1923 and solicited funds for UNC, while trying to sell his plays to Broadway. In February 1924, he began teaching English as an instructor at New York University (NYU), a position he occupied periodically for almost seven years. Wolfe was unable to sell any of his plays after three years because of their great length. The Theatre Guild came close to producing Welcome to Our City before ultimately rejecting it, and Wolfe found his writing style more suited to fiction than the stage. He sailed to Europe in October 1924 to continue writing. From England he traveled to France, Italy and Switzerland. On his return voyage in 1925, he met Aline Bernstein (1882–1955), a scene designer for the Theatre Guild. She was 18 years his senior and married to a successful stockbroker with whom she had two children. Their affair was turbulent and sometimes combative, but she exerted a powerful influence, encouraging and funding his writing. 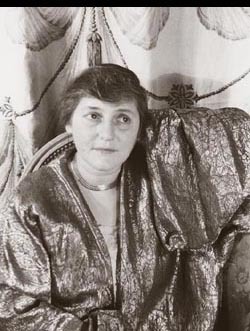 Wolfe returned to Europe in the summer of 1926 and began writing the first version of an autobiographical novel titled O Lost. The narrative, which evolved into Look Homeward, Angel, fictionalized his early experiences in Asheville, and chronicled family, friends, and the boarders at his mother’s establishment on Spruce Street. In the book, he renamed the town Altamont and called the boarding house “Dixieland.” His family’s surname became Gant, and Wolfe called himself Eugene, his father Oliver, and his mother Eliza. The original manuscript of O Lost was over 1100 pages (333,000 words) long, and considerably more experimental in style than the final version of Look Homeward, Angel. After numerous rejections it was accepted by Scribner’s, where the editing was done by Maxwell Perkins, the most prominent book editor of the time, who also worked with Ernest Hemingway and F. Scott Fitzgerald. He cut the book to focus more on the character of Eugene, a stand-in for Wolfe. Wolfe initially expressed gratitude to Perkins for his disciplined editing, but he had misgivings later. It has been said that Wolfe found a father figure in Perkins, and that Perkins, who had five daughters, found in Wolfe a sort of foster son. 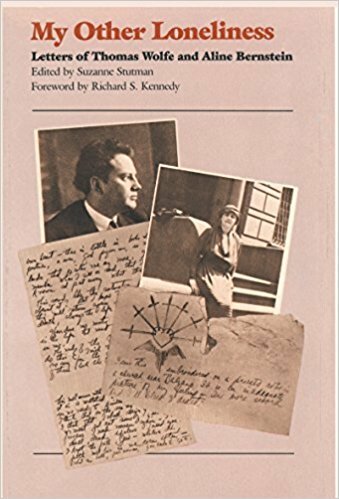 The movie, Genius, is a fair stab at analyzing the relationship, but I find the film as unwatchable as I find Wolfe’s books unreadable. That is, I watched the first 30 minutes, but couldn’t go on. Same with Gone With The Wind. What is it about Southern writers and me? I’m reminded of my wife’s dismissive parody line from Faulkner – “Ma could never forgive what Pa done to Sis the night the hogs ate Willie.” My wife was from Kentucky. The novel, which had been dedicated to Bernstein, was published 11 days before the stock market crash of 1929. Soon afterward, Wolfe returned to Europe and ended his affair with her. The novel caused a stir in Asheville, with its over 200 thinly disguised local characters. Wolfe chose to stay away from Asheville for eight years due to the uproar; he traveled to Europe for a year on a Guggenheim fellowship. Look Homeward, Angel was a bestseller in the United Kingdom and Germany. After four more years writing in Brooklyn, the second novel Wolfe submitted to Scribner’s was The October Fair, a multi-volume epic roughly the length of Marcel Proust’s In Search of Lost Time. After considering the commercial possibilities of publishing the book in full, Perkins opted to cut it significantly and create a single volume titled Of Time and the River. It was more commercially successful than Look Homeward, Angel. In an ironic twist, the citizens of Asheville were more upset this time because they hadn’t been included. 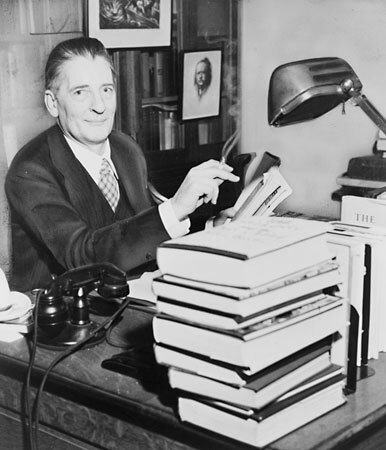 In 1938, after submitting over one million words of manuscript to his new editor, Edward Aswell, Wolfe left New York for a tour of the West. On the way, he stopped at Purdue University and gave a lecture, “Writing and Living,” and then spent two weeks traveling through 11 national parks in the West, the only part of the country he had never visited. Wolfe wrote to Aswell that while he had focused on his family in his previous writing, he would now take a more global perspective. In July, Wolfe became ill with pneumonia while visiting Seattle, spending three weeks in the hospital there. His sister Mabel closed her boarding house in Washington, D.C. and went to Seattle to care for him. Complications arose, and Wolfe was eventually diagnosed with miliary tuberculosis. On September 6, he was sent to Baltimore’s Johns Hopkins Hospital for treatment by the most famous neurosurgeon in the country, Dr. Walter Dandy, but an operation revealed that the disease had overrun the entire right side of his brain. Without regaining consciousness, he died 18 days before his 38th birthday. His last writings, a journal of his two-week trip through the national parks, was found among his belongings hours after his death. A great deal of his work was published posthumously, including, in recent years, reconstructions of the originals of his much-edited novels. I’ve given a fair raft of down home Southern cooking in these pages, so you can take your pick. North Carolina boarding houses were and are rightly famous for their cooking, and I am sure Wolfe’s mother and sister were strong practitioners. 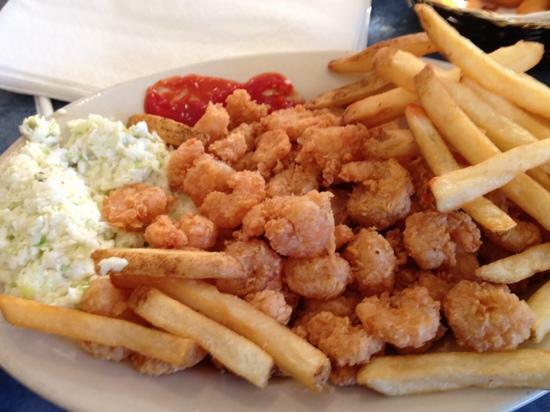 My taste for (some) Southern dishes comes from my year living in a boarding house in the Tidewater. 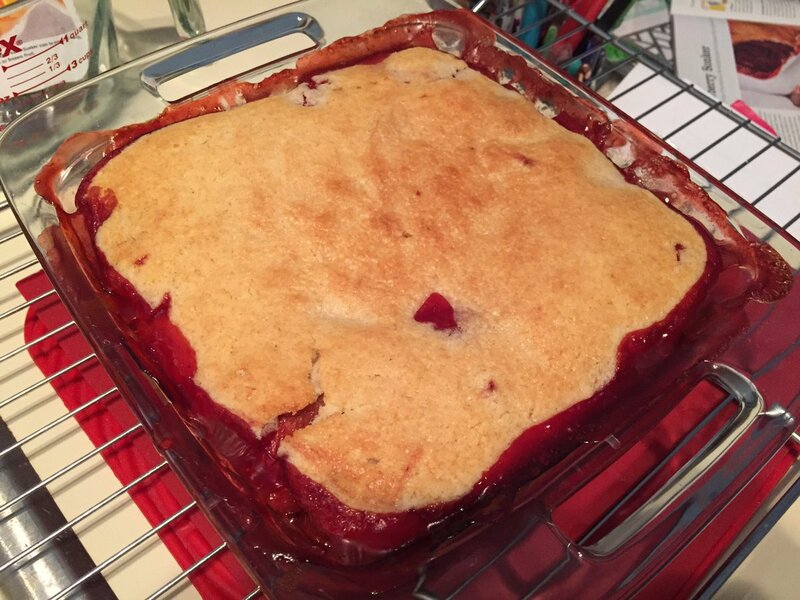 Here’s an old favorite, strawberry sonker, which is reminiscent of cobbler. You can make it with just about any fruit you like, but strawberry is the classic. My landlady made this in the spring, rolling out the pastry and breaking it into irregular shapes for the top. You can make a lattice crust of the pastry, spread it evenly, or do as my landlady did. Like Wolfe’s writing, this dessert is too much for me to take in anything but the smallest quantities. For the pastry: Mix together the flour and a pinch of salt in a large bowl. Work in the shortening with a pastry blender or your fingertips until the mixture resembles breadcrumbs. Turn out on to a wooden surface. Whisk together the egg and vinegar in a small bowl. Make a well in the center of the flour mixture, pour in the egg mixture, and stir with a fork, pulling in the dry ingredients from the sides, to form a soft dough making sure that all the dry ingredients are completely incorporated. Divide into 2 uneven balls of ⅓ and ⅔ of the dough. Flatten the balls to disks about 1 inch thick, wrap well, and refrigerate for at least 3 hours, or up to overnight. Position a rack in the center of the oven and preheat to 375°F. Lightly grease a 9×13” baking pan. For the filling: Whisk together the sugar, flour, cinnamon, and nutmeg in a large bowl. Whisk in the water and butter until smooth. Gently stir in the strawberries. To assemble: Using lightly floured fingertips, press the larger disk of dough evenly across the bottom and up the sides of the prepared pan. Bake until the pastry is dry to the touch, but not browned, about 10 minutes. Pour in the strawberry mixture. Roll out the remaining dough and prepare the top in the way you wish: lattice top, regular pie crust, or irregular scraps scattered over the top. Brush the pastry with melted butter and sprinkle with sugar. Bake until the pastry is deep golden brown and the filling bubbles, 45 to 50 minutes. Let cool on a wire rack for at least 15 minutes before serving. Meanwhile, make the dip. For the dip: Whisk together the sugar, cornstarch, and salt in a medium saucepan. Whisk in the milk until smooth. Cook over medium heat, stirring with a heatproof spatula until the mixture thickens enough to coat the spatula, about 5 minutes. Remove the pan from the heat and stir in the vanilla. To serve, scoop warm sonker into serving bowls. Ladle a little warm dip over the top and serve at once.